Can I put in a brushless motor in dt03 racing fighter if so which one please? 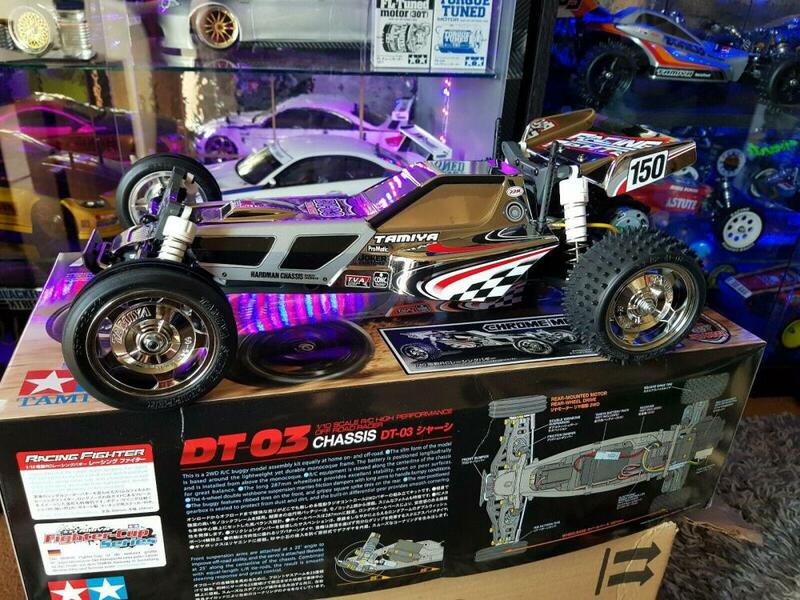 Just about to buy a racing fighter dt03, (tomorrow) before I order the basic kit with esc - can you put in a brushless motor in this? Or not a good idea. Was going to buy a 540 sport tuned as opposed to a 540 torque tuned motor as mainly used on road. ........but then thought it might be an idea to go down the brushless route for extra speed? I'm going to fit it with sealed bearings too. Advice very much appreciated chaps ...and many thanks. can﻿ you put in a brushless motor in this? A hardened steel pinion is a must when going with more power, and the chassis only has the 17t or 19t option, so I got both. Brushless Esc wise, I'm liking the , hobbywing 10bl120, can run down to a 4.5t motor (64,000 rpm on a 2s Lipo, in the region of 3 X faster than the sport tuned). Depending on what we are doing my sons's DT03 runs a 4000kV or a 5600kV both using the hardened 17T pinion. I loaded up the front with some lead to try and keep the front wheels on the ground, ended up modding a Lunch Box wheelie bar to stop the thing from flipping onto it's back. Once you get some speed up, the front generates a fair bit of understeer. On an oval dirt track it is a challenge to cut good consistent laps. I have run 3300kv (13.5 turn) and 4400kv (8.5 turn) in mine. Both have been fun, but the 4400kv was a bit nuts in my opinion. And the gearbox internals wore out quite quickly. I think something up to 4000kv (around 10.5 turn) using the 19t steel pinion would be great. I am in a big fan of the hobbywing quicrun 10bl120 as well, and if you do go Lipo then the square packs fit with no trouble. As mentioned above, plenty of weight in the front of the chassis (ebay for full size car sticky wheel weights is cheap and effective) and stiffer rear springs if you go on to tune it. If the kit comes with the standard TBLE-02S ESC then why not just buy a 13.5T brushless motor and steel 19t pinion and see how it goes? 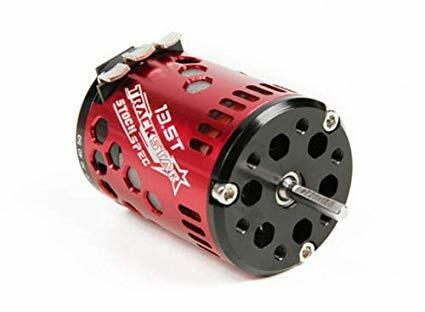 If you want more power then you probably need to look at a new ESC as well, but a cheap brushless motor will cost about the same as the Sport Tuned. I've found Speed Passion and Trackstar to be good bang for buck. They aren't the fastest around but at 1/4 the price of the fast ones they are plenty good enough. Firstly, ball bearings will get you 10-15% extra speed. Anyway, I would get a Tamiya TBLE02S ESC, and get a 13.5t sensored motor + a 19t steel pinion (just like Jonathon said. Not because Jon, ThunderDragon and Lefty said it, but because it's sensible). I think even the Sport Tuned is decent enough for a basher. But a brushless will pull ahead of Sport Tuned easily. With a sensored motor, you don't have to worry about cogging. 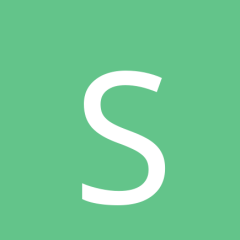 If you want brute power, getting a sensorless is another option. 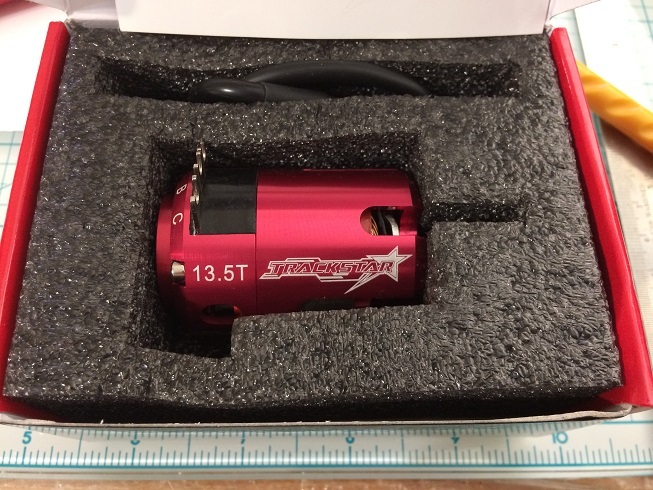 (There are two different types of brushless motors: Sensored and sensorless. They require different types of ESCs) A 3650 sized sensorless brushless about 3300kv would do just fine. One good thing about a sensorless system is, waterproof motor and waterproof ESC. Because the ESC doesn't have to consider feedback from the motor, it will give you more of a kick. Most motors come with wires soldered. Many cheap sensorless brushless come with 60A ESC. Which means about 3300kv would be the upper limit, just like the sensored version. If so, why not stick with a sensored one? If you are not used to the chassis, you'd drive slowly. A sensored motor will give you smoother control, whereas sensorless can be jerky at lower speed (known as cogging). Tamiya TBLE02S ($20: it can power a sensored motor also) or Hobbywing 1060 ($20. brushed only) + Sport Tuned $17 = $37. Sensorless ESC and 3300KV combo set = $45. 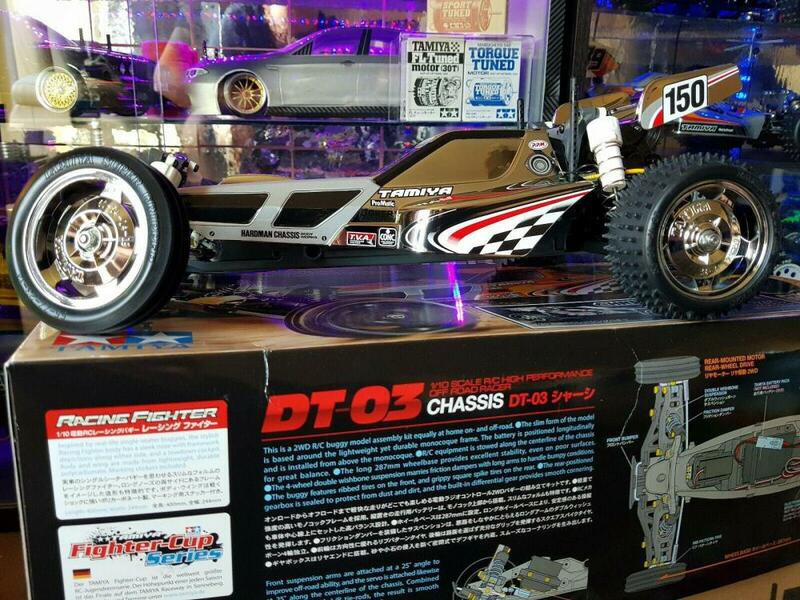 Tamiya TBLE02S ($20) + 13.5t Trackstar Sensored ($35) = $55. Below is a Trackstar 13.5t motor. (Older version. Newer one is fancier looking). I run brushless in my DT-03, and can confirm the advice given above as sound. I run a 13.5T sensored motor (Speed Passion MMM) and steel 19T pinion fed by a TBLE-02 ESC and 2s LiPo with stand-alone battery monitor. It all works superbly, with plenty of runtime and performance, no reliability issues and minimal maintenance required. Bearings are a great idea as already mentioned. I'd recommend getting ones with rubber seals if you plan on using the model off-road. One hop-up I haven't seen mentioned yet is the alloy gearbox bridge set. This pair of blue alloy plates do an excellent job of tying the left and right chassis and gearbox halves together, reinforcing a common point of failure. I would recommend getting a pair for your build. 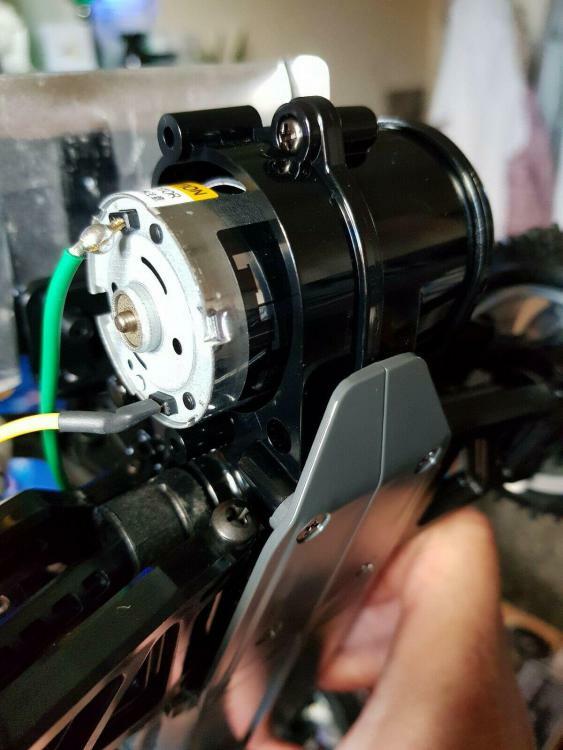 I'm so chuffed - thank you - trying not to sound to *******-kissy but that is amazing and clear advice - I was just about to buy the 540 sport tuned motor and checked back on here and now I'm buying the sensored 13T brushless - with those bridges you mentioned. big thank you to all who have replied - 100% brilliant! this is for my 9 yr old son BTW -it's his birthday in a week - he wants to beat his mate in a street race, who has a grasshopper with 540 sport tuned motor. excuse my naivety but I'm learning fast thanks to you lot. No, well, I'm running Schumacher hardened pinion in mine, a 32dp (0.7938 mod, not the 0.8mod, but real close) and it's been fine so far, and I've run 5700kv / 5s @ 60mph, and currently 4300kv / 3s on the beach. 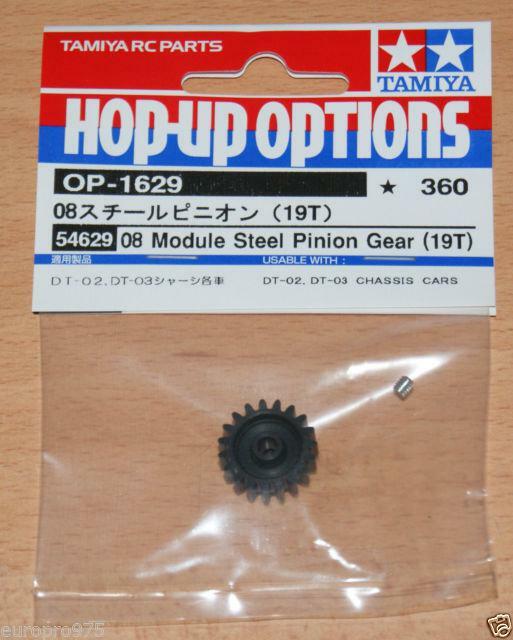 As per the above, I've used the RW Racing 32dp 17T pinion and I currently have the Tamiya 19T 0.8 mod pinion that you have referenced above (#54629). I have tried pinions from a few manufacturers, in both 32DP and 0.8 Module, and while they have all worked, the Tamiya steel 0.8 module ones have been the smoothest and quietest, which I equate to having the best mesh and thus the longest lifespan. I've also seen low turn motors on ebay at lower price. Because of the limit imposed by most ESCs, anything lower than 13.5t is hard to sell, forcing sellers to lower the price. If you want to leave an option for making it a pocket-rocket, 10bl120 would be a good choice. I agree here. Tamiya steel pinions aren't exactly expensive either. As for the 10bl120 on low tutn motors, I had it running a 7.5t 5200kv in my DT03 with truck wheels and everything was getting very very hot. Might have been OK on regular buggy wheels bilut that's not what I use. 8.5 4400kv was no problem electrics-wise but I broke things. I think with very low tutn motors the gearing doesn't go low enough. On the 17t pinion it's only about 9.2 FDR. On road with correct gearing would be no trouble at all I expect. Sorry for the high jack. Hmm. If the idea is to win a street race, perhaps fitting a Sport Tuned would be a good idea? Matching the other kid's motor would make for fairer racing whereas fitting you son's car with a significantly faster one might just kick off an "arms race" which will eventually lead to both cars being fitted with motors that make them way overpowered, more prone to breakage and ultimately less fun. The superior suspension and handling of the DT-03 will already give your son an advantage in a race against a Grasshopper. Beautiful. No way to put it any more clearly. Good point Turnip, nothing wrong with a fair competition, but nothing like 'hands-down' kicking your mates a**s* in a street battle , his mates parents aren't short of a few quid, so I'm sure they'll come back with something, all in the name of good fun. Also buying the speed passion MMM next week (and have some sealed bearings on the way for it) It will be well looked after, he's a pretty good driver my boy. Lols like a good buy! Will you be fitting the upgrades yourself prior to the birthday, or giving them to him separately for him to fit with your assistance? Thanks Turnip, yeah good buy I hope, was £80 plus delivery charge - all built off an ebayer with high feedback and was good when communicating with him. I'm going to give my boy the the car 'as is' ... but buying the Speedpassion anyway on tuesday, and as soon as he's had a few fair races with his buddy - then when he gets bored of the 540 torque motor - in goes the brushless. Out of interest turnip - the torque and sport tuned 540 - about the same in a flat out street race? - I'm thinking the torque a little better on grass/rough ground - but sport better on tarmac etc? The Sport Tuned will have the edge in both settings, unless you are planning an endurance race in which case the lower current draw of the Torque Tuned would give the advantage of longer runtimes. Just make sure the street race has some corners in it, and the Racing Fighter should beat a Grasshopper quite easily even if it has a bit less power. It is significantly superior in terms of handling.